Rooms with blue and white decor, no matter what size or decorating style, have a lot of choice when it comes to Christmas decorating. 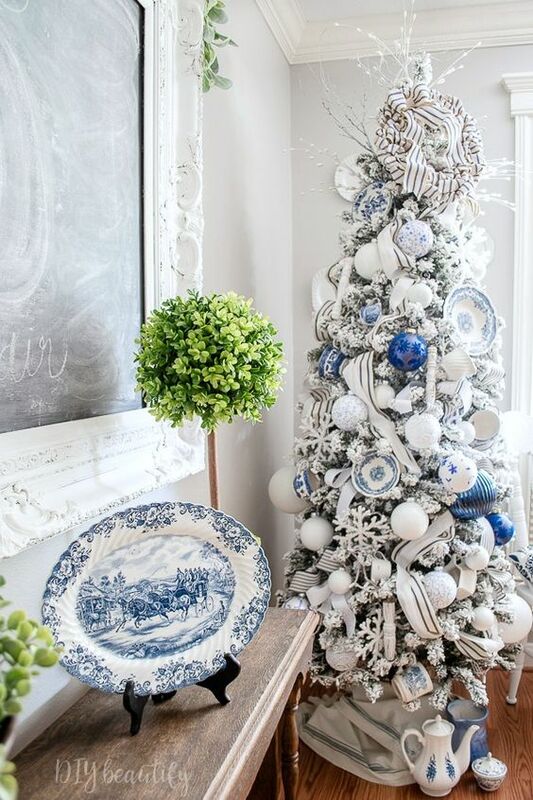 Blue and white is such a classic combination and perfect to create luxurious room for Christmas decorating. You may decide to stay traditional with red, green and gold, liven it up with mint, deep reds and hot pink or stay with blue, silver and white. But you don't have to stop there. Here are some more color schemes that are beautiful color fusions for Christmas decor. You want to make an impact, but remember, your Christmas decorating should make you feel joyous and festive. It should have the element of surprise and it feel welcoming for all your guests. Whichever one you choose, your colors should look harmonious with the rest of your home. 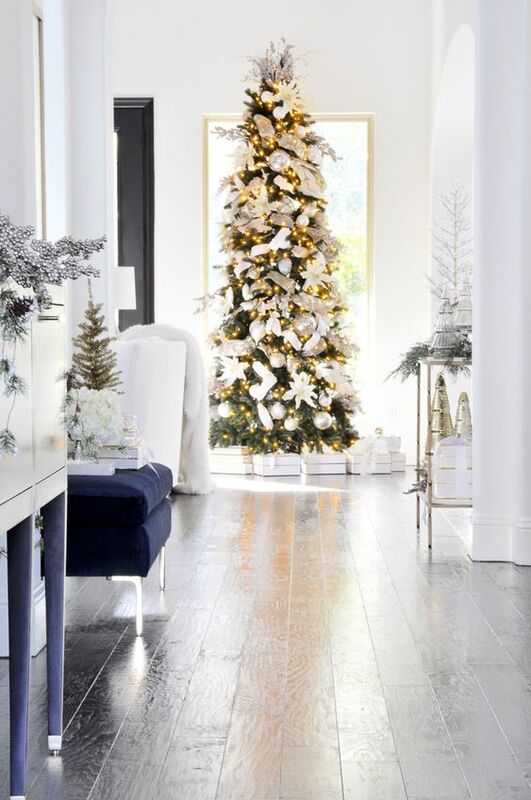 Here are some ideas to guide you and create luxurious Christmas decorations. 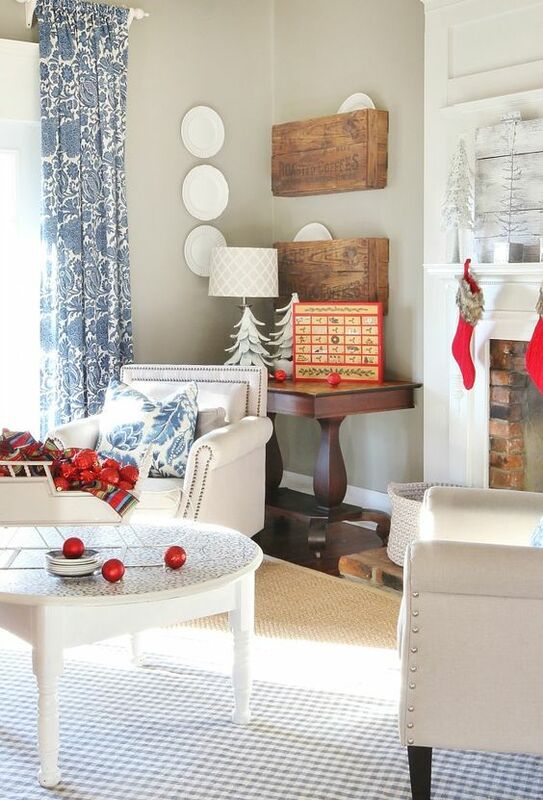 If your home is decorated with in slick mid-century blue and white decorating style, country farmhouse Christmas decor will probably look a little lost. From sleek and sophisticated to farmhouse or industrial, use decorations that suit and enhance your existing decor. Wayfair is having a sale on some of their Christmas decorations and its worth looking for something different or unique. Do your best to choose a Christmas color palette you carry throughout the house. This will avoid connecting rooms from looking disjointed or out of place. Repeat the main decorating colors in each room. If you need to, add different accents from one room to another. Your decorations don't have to be identical but it works best if the colors are the same. You can bring all the rooms together by using a common ribbon or garland style. This living room’s chilly blue-and-cream palette is warmed with pops of red, magnolia leaves, blue and red baubles with a gingham touch. Blue and white might be a traditional color scheme but from pale blue, ice blue to royal blue, soft white or crisp white, there are thousands of blue and white combinations. The Christmas decorations you choose will depend on how light, deep, rich, soft or neutral your color scheme might be. Consider a crisp white room with white furniture and a few blue accents. What would create the most drama? Something with deep reds and greens or something with rich blues? Do you prefer one dramatic feature or smaller decorating items around your rooms? Reds, yellows, and golds are warm colors. Blues, white and silver are cool colors. If you live in a climate that's freezing cold over Christmas use colors like reds, greens and golds to make your rooms feel cozy and warm. But if you live in a warmer area, using cooler silvers and blues, alone or with touches of red might be best this time of year. If you want a simpler look consider a monochromatic design choosing decorations in every shade of one single color. If you have white walls, with blue decor accents and red is your color think of all different reds you can use. That means using rose, fuchsia, ruby, cherry, firecracker, cranberry or burgundy together in every shade for your all decorations. You can do this with every color and tie your look together using one main color, a second color, ribbon, texture or design. Layer texture in your decorating to create interest. 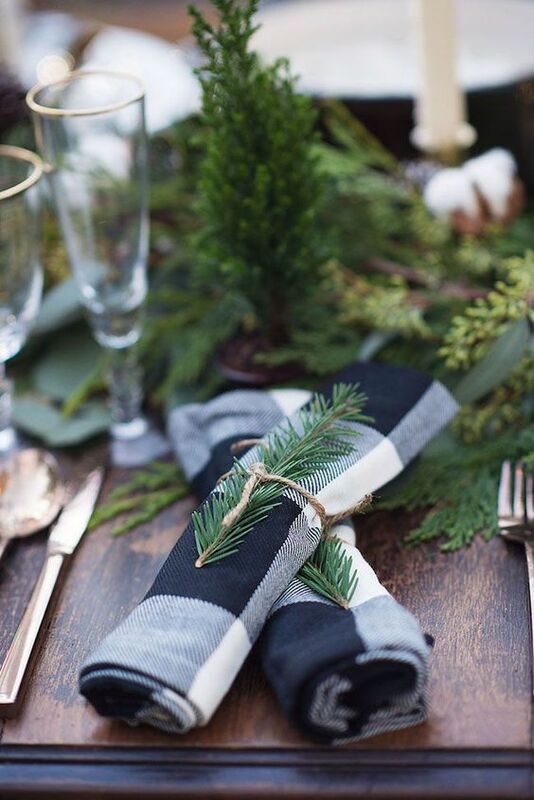 You can use garlands, different styles of bauble decorations and ribbons to add contrast and texture. It's as easy as using cushions or throw pillows or rugs, mats, trays, china or vases with the Christmas theme and Antique Farmhouse has a sale with lots of wonderful farmhouse style decorations. Your choice of ribbon and bow style is a perfect unifying element for your Christmas decor. Whether you use the same ribbon throughout or similar ribbon styles in different colors or widths for candle holders, swags or garlands make sure you have enough to complete your decorating through out the house. French ribbons with a wired edge are more expensive with most soft ribbons but they can be used each year and the supporting wire will stay in place for the perfect bow, staircase garland or curled wreath bow tails. Even the smallest home can be festive. Add a few Christmas touches like stockings on the mantel. Anything that brings out your blue and white decorating features. 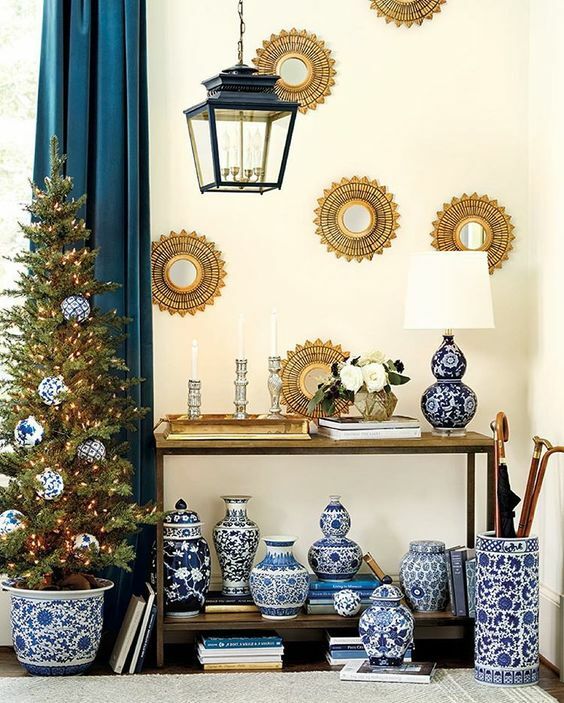 This is your blue and white Christmas room guide. You can see our other Christmas guide for this year here.